I bid on a lot of low-grade, slabbed pre-WW II Phillies cards on eBay. The overwhelming majority of the time, I’m submitting bids that are at least one-third or more below what I would consider a fair value as I’m just looking to get extremely lucky. (This is not to be confused with instances where I submitted a bid with a maximum amount I considered fair, which is how I’ve ultimately purchased most of my pre-WW II Phillies collection.) The overwhelming majority of the time, nothing ever comes of it. However, once in a rare while, a card somehow slips through the gaps and I end up with a wonderful, unexpected addition to the collection. 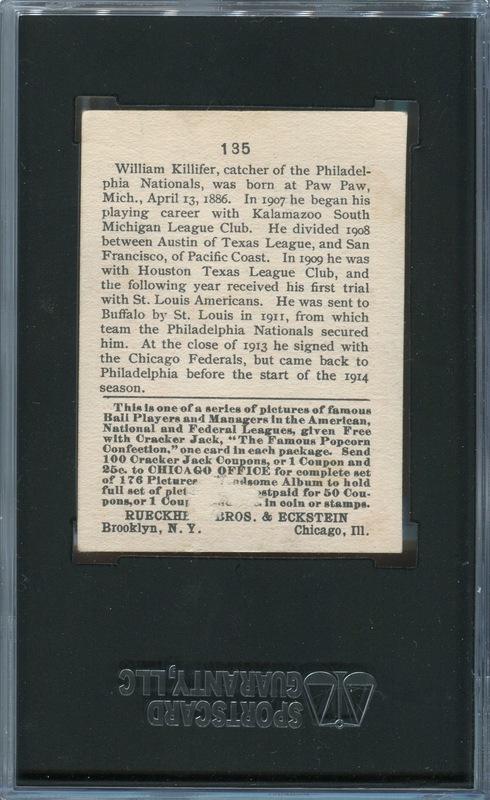 That’s how I added the 1915 Cracker Jack Bill Killifer card that just arrived at my house today. All things considered, it’s actually a gorgeous card. The only reason it received a grade of SGC 20 is some paper loss on the back of the card. With that bit of missing paper, I easily envision this card garnering a grade of SGC 50 (VG-EX). 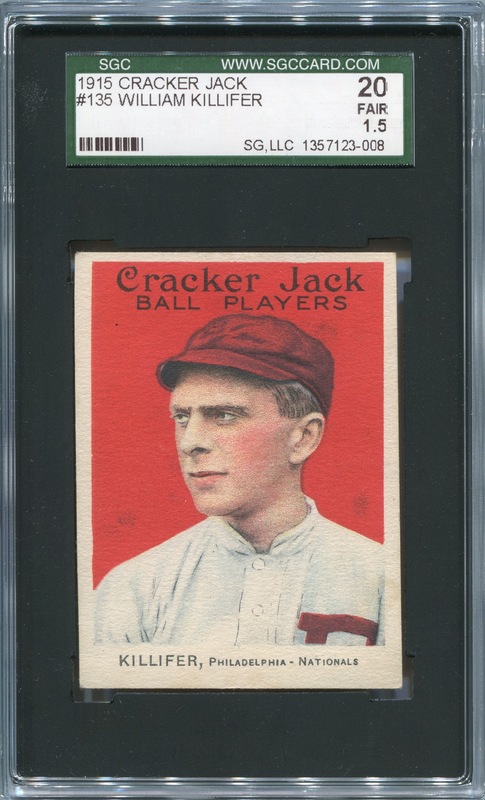 Regardless, even with that flaw, this card has much better eye appeal than the only other 1915 Cracker Jack card in my collection. A few years ago, I never imagined owning any of the Phillies in this set, and now I have two. There’s no way I’ll ever assemble a complete team set — not with the prices that the Grover Alexander card goes for, even in poor condition — but after this lucky grab I’ll certainly continue submitting low bids for cards of this vintage and condition. I’d much rather spend $60 on a card like this than an equivalent amount on almost any new autographed memorabilia card, no matter how small its stated print run.